Everything you need to prepare meat for storage. 18" x 300' roll of 45# freezer paper that protects meat from freezer burn and bacteria. Sanitary polycoating on the paper prevents meat from sticking to paper while freezing or thawing. 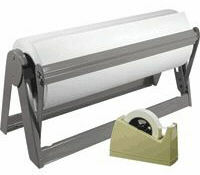 Sturdy freezer paper dispenser with spring-loaded cutting blade and legs with predrilled holes for mounting onto table or wall. 3/4" x 44yd roll of freezer tape with dispenser.